PT PP Properti Tbk - PP Properti is a rapid growing public-listed company in Indonesia that is involved in property business. 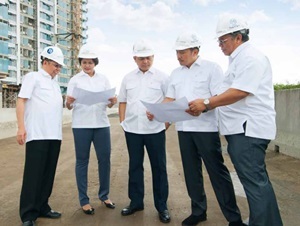 PP Properti operates primarily as a property developer and has strong business competencies in three business pillars: Commercial, Residential and Hospitality. Its business include development, construction and management of several commercial building, office, apartment, residence, hotel, mall, trade centre and other facilities. PT PP Properti Tbk is a member of state-owned construction firm PT PP (Persero) Tbk (PTPP Group). PT PP Properti Tbk was formed on 12 December 2013 as spin off results of Property Division of PTPP Group. In 2015, the Company went public and its shares are listed on the Indonesia Stock Exchange (IDX) under reference code PPRO. As of December 2017, PT PP Properti Tbk is 64.96% owned by PTPP Group, 0.06% by YKKPP, 8.85% by PT Asuransi Jiwasraya (Persero) and 26.13% by public. Based in Jakarta, PP Properti now has 5 subsidiary companies, 4 associated companies, 4 investment in shares companies and 2 join operation companies (KSO). According to PT PP Properti Tbk Annual Report 2017 as cited by JobsCDC.com, PP Properti recorded a satisfactory performance growth in the business year of 2017. Total assets in 2017 recorded as Rp 12.56 trillion, 41.92% increased to previous year of Rp 8.85 trillion. Referring to its annual report, PP Properti reported total operating revenue of Rp 2.71 trillion in 2017. This number is growth 25.99% year-on-year (YOY) from Rp 2.1 trillion in 2016. Total net profit in 2017 reached Rp 459.66 billion or growth 25.55% YOY as compared with Rp 366.10 billion in 2016. Minimum educational background in Bachelor Degree (S1) from reputable University, majoring in Accounting with minimum GPA of 3.00 out of 4.00. Good understanding about the financial statements (cash flow, balance sheet, and tax). Minimum educational background in Bachelor Degree (S1) from reputable University, majoring in Architecture with minimum GPA of 3.00 out of 4.00. Minimum 1 year of experience in the same field. Preferably have experience in designing High Rise Building. Operating knowledge of MS Office, AutoCAD, Sketch Up, Photoshop and any other programs that support the work. Minimum educational background in Bachelor Degree (S1), majoring in Civil Engineering / Architecture. Strong understanding of project cost control. Strong understanding of just in time management, purchasing, and supply chain. Strong understanding of tools and logistics management. Strong understanding of QSHE planning and controlling. Strong understanding of Project Risk Management. Have good negotiation skills and team work. Strong understanding of business property process. JobsCDC.com now available on android device. Download now on Google Play here. Please be aware of recruitment fraud. The entire stage of this selection process is free of charge. PT PP Properti Tbk - Finance Officer, Architect Engineer, Project Manager PTPP Group April 2018 will never ask for fees or upfront payments for any purposes during the recruitment process such as transportation and accommodation.